Computers can bring a range of benefits for people with a wide spectrum of learning difficulties. Some people who struggle to spell words and assemble coherent sentences might benefit from specialist programs. Clicker 5 is a popular writing support and multimedia tool that allows people to write by selecting letters, words or phrases from a special picture- and speech-supported grid. Computers can make the text in emails, documents and web pages more accessible through the use of fonts, text-to-speech and symbol support. Existing paper documents can be transferred on to a PC using OCR Scanning technology and opened in software that contain these features. An increasing number of e-books are available to download from digital bookstores such as eBooks.com and there is also a large collection of free out-of-copyright e-books available at Project Gutenberg . Multimedia advocacy is a motivating and effective person-centred method of communication for people with learning difficulties. Creating multimedia using modern computers is becoming increasingly easier and much of the software used is completely free. It allows people with cognitive difficulties to bring together video, pictures, sounds and symbols into a single package that communicates their needs, wishes or achievements. A well received example is the multimedia profiling pioneered by John Ladle at Acting Up, the details of which are clearly presented on the Acting Up Website . The advantages of multimedia advocacy are promoted by The Rix Centre at the University of East London. Computers can help assess and develop very basic skills such as the emerging awareness of activities and events through to proactive interaction and choice making. A switch attached to a fan or a lamp can provide a user with basic environmental control that can be highly motivating and develop an awareness of cause and effect. More advanced skills can be explored through a computer interface via a switch and specialist software that introduces skills such as choice making and timing. Some mainstream software, such as Powerpoint, can be adapted into an affordable platform allowing professionals to create highly accessible and motivating activities. I have a created an example activity that you can download and try out even if you don't have Powerpoint. People with the most profound and multiple learning difficulties (PMLD) often enjoy and react to the basic sensory stimulation found in High-Tech Sensory Rooms and specialist computer programs. Simple input devices like switches and touchscreens allow people to have some control on their environment and participate in motivating activities. The complex nature of most software and some hardware can be a barrier that stops people with significant learning difficulties from being able to access a computer in a confident, comfortable and efficient manner. Keyboards have over a hundred keys, many of them with cryptic names like Alt Gr and Sys Rq. Less than a quarter of the keys are actually letters of the alphabet. 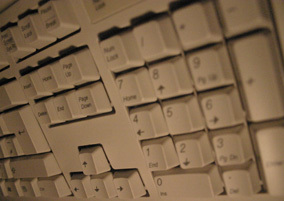 Simpler keyboards such as the IntelliKeys or BigKeys can make computer access much easier for people with learning difficulties. Even inexpensive keyboard stickers and keyboard gloves can make it easier for people to access the computer. The concept of the mouse can be very difficult one for people with learning difficulties to grasp. The relationship between the movement of the mouse and the pointer on the screen is not obvious to all, and it can be difficult to determine when and when not to click. Many users find large rollerballs such as the BigTrack much easier to control and the physical separation of the ball and the mouse button means they are less likely to move the pointer while attempting to click the mouse. Touchscreens have also proven to be a successful alternative due to their direct nature. Although there is software available that has been specifically designed to be easy to use a lot of mainstream software can be adapted to achieve the same result. Microsoft Word, the world's most popular software package, is a good example. The toolbars, menus and fonts can all be easily simplified to make the software less cluttered and more visually accessible. The display of Microsoft Windows can also be simplified to make it more suitable for users with learning difficulties. Quite often specialist software will be needed to ensure the best access possible. Popular choices include Clicker and the Widgit Software range of symbol-supported programs such as Writing With Symbols and Communicate: In Print. Widgit also make a symbol-supported web browser called Communicate: WebWide. Even the most accessible software still sits on the complex Windows environment 'shell'. This consists of the familiar Task Bar, Start Menu and Desktop. The shell is very flexible and can be customised to make it easier to access using large icons and keyboard shortcuts. Alternatively the shell can be replaced with an entirely new environment that allows the user to select their activity in an understandable and efficient manner. Find books about learning disabilities, autism and other severe cognitive difficulties.